I hope you have had a wonderful summer and are enjoying time with your family and potentially some time out of the office. I am pleased to report that June was Scoliosis Awareness Month and during it SRS had significant activities related to this as well as public engagement. We were connected through Facebook, Instagram, LinkedIn and Twitter. This led to 228,038 total impressions and 15,571 total engagements. We had an outstanding 25th IMAST meeting. The sessions were great and the feedback was excellent. Based on some of the feedback from member sessions important changes will be happening going forward. IMAST will receive separate abstract submissions and in 2020 the meeting will be held in April instead of July. Exact dates and locations are still under review by the Long Range Planning Committee. The meeting will partially return to its original intent of showing new innovative techniques, potentially shorter follow-up and more hands-on training. Likewise, we are looking forward to a spectacular Annual Meeting program to be held in the wonderful city of Bologna, the gastronomic capital of Italy. Suken Shah is preparing a fantastic Pre-Meeting Course focused on physician wellbeing and health and Greg Mundis has a terrific program planned for us. Our Howard Steel lecture will be a noted culinary and wine expert, Kevin Zraly, speaking about food and wine of the region. The Harrington Lecture will be given by James Kerr, the author of “Legacy”, the global bestseller about leadership and the principles that led to the achievements of the world’s most successful rugby team, the All Blacks, from New Zealand. His lecture will focus on these principles and is titled, Insight into the Success of the All Blacks. Note: During the Annual Meeting there will only be two business meetings, Thursday October 11, 13:30 to 14:45 and Friday October 12, 7:30 to 8:45. While there will be fewer meetings, they have been increased in duration so that only 30 minutes of our normally allotted time will be missed. Members will continue to hear about the work of the committees and the councils over the last year and voting will be held for new officers and members of the 2018-2019 Nominating Committee. Other exciting modifications to this year’s meeting include beginning the scientific program the afternoon of Wednesday, October 10 which allows for 20 additional abstracts, as well as the terrific Pre-Meeting Course that morning. I would like to thank the committee members and council chairs for their incredible hard work in running the business of the Society and the fantastic job they have done. I also want to give thanks to my partner members on the Presidential Line and our Board of Directors for their support. I believe it has been a spectacular year for the SRS with great changes implemented and fantastic things to come. I look forward to seeing you all in Bologna. Gordon W.D. Armstrong was born to missionary parents in Hong Kong in 1923. His family returned to Canada in 1927 when his father was stricken with malaria. This early exposure led to a lifelong connection with China. Dr. Armstrong received his Doctor of Medicine degree from Queen’s University in 1947. During his residency at the University Toronto he was exposed to spinal surgery through Robert I. Harris, Fred P. Dewar and Ian Macnab. Further study with J.I.P. James at the Royal National Orthopaedic Hospital in London, England stimulated his interest in spinal deformity surgery. From Sir Herbert Seddon, he learned anterior approaches to the spine. Dr. Armstrong returned to Ottawa to begin practice at the Ottawa Civic Hospital in 1953 and practiced there until his retirement at 65 years of age in 1988. Between 1975 and 1987 he served as Chief of the Division of Orthopaedics. In 1963 he traveled to Minneapolis, MN to learn Harrington instrumentation from John Moe. This truly began his career as a spinal deformity surgeon. He was a founding member of the Scoliosis Research Society (SRS) and its President in 1980-81. He also served as President of the Canadian Orthopaedic Association from 1984-1985. While in practice in Ottawa he met Molly Burnett, an x-ray technician, at the Ottawa Civic Hospital. They wed in 1955 and remained married for 63 years until his death. They had five children: Doug, John, Jamie, Mary Jane and Beth. All three boys became physicians, Doug becoming a pediatric orthopaedic spine deformity surgeon. Always an innovator, Dr. Armstrong had a long and fruitful relationship with the National Research Council of Canada. Together they developed a transverse loading system for scoliosis surgery, a machine for the use in Moire topography, and one of the first anterior spinal plates. He started taking spine fellows in 1976 and trained twelve fellows in addition to five Chinese fellows who were funded by the Canadian International Development Agency. Dr. Armstrong maintained his close ties with China and in 1980 was asked to operate on Deng Pufang, the son of the Chinese leader Deng Xiaoping. Mr. Pufang was a victim of the Cultural Revolution and had become paraplegic by mob violence. He was secretly flown to Ottawa for surgery. This led to a formal collaboration between the Ottawa Civic Hospital and the Beijing Union Memeorial Hospital. Fourteen Chinese doctors of various medical specialties were eventually trained in Ottawa. A true giant in spinal deformity surgery, Dr. Armstrong remained humble and self effacing. He possessed a sneakily quick, dry sense of humor. He was always kind and caring towards his patients. He and his wife treated his fellows like family, adopting them into their orbit, being truly interested in their children, and inviting them to their house for dinner or out to the family farm in Smith’s Falls. There was always a visiting retinue of Chinese doctors and researchers who they also took under their wing. Dr. Armstrong was dedicated to spinal deformity surgery and his patients. He relaxed by fixing grandfather clocks, some thing of which he was quite proud. Above all he was dedicated to Molly and his family. Robert “Bob” M. Campbell, Jr. passed away peacefully on July 29th, 2018 surrounded by his family. Though he battled illness for years, Dr. Campbell was a true warrior for his family and patients, caring for children until just a few days before his death. His innovative thought-leadership and inventions changed the world’s approach to children with complex, life-threatening spine and chest wall deformities. The essence of Dr. Campbell’s contribution to pediatric orthopaedic surgery is this paradigm shift: the focus of treating children with complex spine and chest wall deformities should be on pulmonary function, not on the major curve angle measurement of their scoliosis. His tenacious drive to evangelize the critical importance of preserving or improving pulmonary function, and his success inventing devices to support spine and chest wall growth, explain why colleagues refer to him as “the Charnley of early onset scoliosis”. Born on May 7, 1951, Dr. Campbell was raised in Nashville, TN, graduating from Father Ryan High School in 1969. He matriculated to Vanderbilt University where he played football (“I was the smallest linebacker in the SEC”), then transferred to Johns Hopkins University, graduating with a BS in Natural Sciences in 1973. After completing Georgetown University Medical School in 1977, he did his surgical internship at Tripler Army Medical Center in Honolulu, Hawaii, then his orthopaedic residency at Fitzsimmons Army Medical Center in Aurora, CO. After four years of military service at Kimbrough Army Hospital in Fort Meade, Maryland, he completed a pediatric orthopaedic fellowship at A.I. DuPont Hospital under the tutelage of G. Dean McEwen. In 1986, Dr. Campbell began his career at Christus Santa Rosa Children's Hospital/ University of Texas San Antonio, rising to Tenured Professor and holder of the President's Council/Dielmann Chair in Pediatric Orthopaedic Surgery. In 2008, he was recruited to the Children’s Hospital of Philadelphia (CHOP) to take a leadership role in the rapidly growing multi-disciplinary Thoracic Insufficiency program. In 2009, he launched CHOP's Center for Thoracic Insufficiency (CTIS), attracting infants and children from around the world, many of whom were told "nothing can be done". He grew the team approach to care, collaborating closely with pulmonologists, thoracic surgeons, intensivists and radiologists to optimize treatment of children with severe spine and chest wall deformities. Dr. Campbell invented the VEPTR (Vertical Expandable Prosthetic Titanium Rib) device, taking a customized solution for a single child in San Antonio in desperate need of chest wall support through conceptualization, fabrication, testing and the arduous regulatory pathways of the Federal Drug Administration. His invention became the standard of care throughout the world for children with severe deformities of the spine and chest, saving or extending the lives of children with previously untreatable conditions. From 1991-2004, he led the FDA Feasibility Study: Thoracodorsal Reconstruction in Children with Vertical Expandable Prosthetic Titanium Ribs, IDE #G900179, travelling worldwide to train surgeons on the indications and surgical techniques to treat thoracic insufficiency using the VEPTR device. One of the least heralded contributions Dr. Campbell made to the field of pediatric surgical care was facilitating new device development through his involvement with the FDA. He leveraged the relationships he built at the FDA to foster countless other devices through the regulatory process. He was named by the agency one of the 30 “Heroes of the FDA”. He made frequent trips to FDA headquarters to advise and educate, and created an annual course for surgeons, scientists, device manufacturers and FDA device personnel to promote mutual understanding. In recent years, the regulatory approval processes have eased considerably, paving the way for a new wave of implants to help children; this is in no small part due to his work, expert collaboration and influence. Dr. Campbell received numerous awards and honors, including Congressional recognition (Bill no. 1499, 111th Congress, 2nd session "Honoring the achievements of Dr. Robert M. Campbell, Jr.), The Pediatric Orthopaedic Society of North America Heune Award, The Scoliosis Research Society Walter Blount Humanitarian Award, and the Johns Hopkins University Distinguished Alumnus Award. He held 6 US Patents. Far beyond awards and patents, his patients’ families knew him for his unwavering devotion to their child’s care; the large and growing yearly reunion of CTIS families at CHOP is a testament to the impact he has had on so many. He is survived by his wife Corey and children Abigail and Noah. He is also survived by three sons from a former marriage, Ryan, Sean, and Jake; his sisters, Susan and Betty; his brother, John; and his nieces and nephews, Susanne, Rob, David, and Rachel. He was predeceased by his parents, Robert M. Campbell and Betty K. Campbell. Dr. Campbell will be dearly missed by his family, patients and colleagues, but he has left a lasting legacy through his ideas, inventions, and the many surgeons and physicians he trained. As Dr. Campbell’s colleagues and trainees, we are determined to do just as he advised, and build his legacy into something even greater. To view Dr. Crock's online obituary, please click here. To view Dr. Gray's online obituary, please click here. On March 22, 2018, Dr. John Emmett Hall died peacefully in his sleep at the age of 92. To all those who knew him, Dr. Hall was a giant of medicine. His bravery, his desire to advance patient care, his dedication to teaching, his honesty, and his commitment to his family and friends set him apart. I first worked with Dr. Hall in 1980 as a fellow and remained close with him throughout my life. Below are reflections and stories from our 38-year friendship that demonstrate why this man was so remarkable and why we must carry his legacy forward for future generations. Please visit Spine Deformity to view Dr. Hall's full obituary written by Richard E. McCarthy, MD. To view Dr. Ricciardi's online obituary, please click here. To view Dr. Stevens' online obituary, please click here. 2018 has been a busy year for the History Committee but unfortunately for all the wrong reasons. We have had a significant number of deaths in our membership, including two founding members. In June, Behrooz Akbarnia, Jay Shapiro, Ashtin Neuschaefer and I visited the SRS Archives at the University of Kansas Medical Center. Our main purpose was to review artifacts that just arrived regarding the late George F. Dommisse of South Africa and Alf L. Nachemson of Sweden. Dr. Dommisse’s material on his studies of blood flow to the spinal cord was donated by Evalina Berger from Denver, CO and that on Dr. Nachemson from his associate Dr. Aina Danielsson from Sweden. The latter consisted of his previous notes, publications and other material. The material from both individuals is in the process of being sorted and catalogued by our archivists. Thus far this year we have lost or been notified of the recent passing of 9 SRS members, including two founding members. These will all be honored at the annual meeting in Bologna, Italy, October 10-13, 2018. Look for complete obituaries on several of these members in Spine Deformity, the Journal of Pediatric Orthopaedics or both. IMAST 2018 held in Los Angeles, CA July 11-14, 2018 was again a very successful meeting. It was the 25th anniversary of this meeting. There was a historical display on the development of IMAST as well as comments from previous chairs, especially Randy Betz, MD who chaired the initial meetings. Did you know that 50 years ago, the first natural history study of scoliosis, A Long Term Follow-Up Study of Non-Treated Scoliosis, was published by Alf L. Nachemson, MD, PhD in Acta Orthopaedica Scandinavica. This paper was the first to report on a large series of untreated scoliosis patients. The report does not have radiographic information nor does it have accurate diagnoses, however, it is still an influential report with regard to the mortality rate of untreated sever scoliosis due to cardiopulmonary disease. 2018 also marks the 50th anniversary of the first SRS Morbidity Report. This report was presented by G. Dean MacEwen, MD at the 3rd SRS Annual Meeting and included the neurological complications in scoliosis. Do you submit your yearly Morbidity & Mortality data? 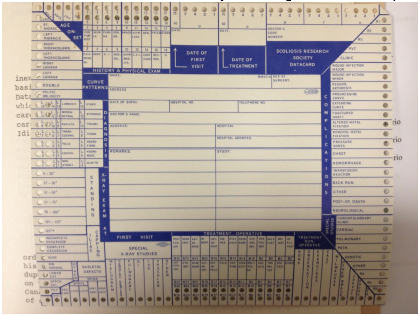 Below is the original M&M data collection cards. Data was collected by pulling string through the appropriate holes. These facts and more can be found on the SRS Historical Timeline, https://www.srs.org/historical-timeline/. This hypothetical case of possible unethical behavior of a surgeon is presented by John Lubicky, MD and the subsequent discussion is written by guest discussant Tim Ward, MD. The Committee would like to thank John Lubicky and Tim Ward and appreciates their valuable contributions. A high volume, senior faculty spine surgeon at a university hospital has a surgical practice that consists mainly of the operative treatment of AIS. Most of the pre-op curves measure in the 40 – 45 degree range and most of the patients are skeletally mature or nearly so. Aside from having the scoliosis, most of the patients are asymptomatic. He is a high earner for the department. He is a fast surgeon and has few complications. He works with residents who are confused about his indications for surgery and from what they have been taught about the natural history of AIS feel many of these cases are not indicated. They have discussed this with their chairman because they feel this is not ethical practice. The chairman declines to address this with the faculty member because he has stated he would leave if anyone tries to curtail his practice or OR time. Other faculty are sympathetic to the residents’ concerns but are powerless to do anything. Is this attending unethical? His surgical indications are marginal for most of his patients. How should this kind of a situation be handled? The premise of this case scenario is that the surgeon in question may be acting in an unethical manner for reasons that presumably benefit him at the expense of exposing patients to needless surgical risk. I think that we can all agree that no surgeon should ever expose a patient to any operation that is definitively unindicated because the surgery absolutely will not help the patient or because the surgery has been justified on information that the surgeon knows to be definitively untrue. I do not believe that this case scenario rises to the level of definitive unethical behavior. The recommendation for surgical fusion on a nearly skeletally mature individual with a 40 to 45-degree curve is in fact quite common in North America. Many recent articles in the peer review literature recommend this approach. The non-surgical approach to a 45-degree curve is probably a minority position in this country although there is a growing body of evidence that non-surgical treatment of the curves in question in our case scenario is a very viable option. A fair examination of the long-term medical consequences of AIS, whether the curve is progressive or not, reveals that definitive serious cardiopulmonary consequence and disabling pain are not generally expected. Surgeons ought not frighten patients into choosing surgery under the guise of preventing cardiopulmonary issues or disabling pain. The literature does tell us that there is a chance that a 45-degree curve may progress into adulthood and progression may be a real cosmetic or psychological concern to the patient. The patient may well choose to undergo surgery to address these cosmetic concerns. Our responsibility as surgeons is to give patients accurate information on the natural history of AIS and to point out the risks and benefits that can be expected if surgery is elected. The decision to undergo elective AIS surgery should be entirely up to the patient and family. We surgeons should never attempt to sway a patient with a 40 to 45-degree curve into having surgery but rather should discuss honestly all of the factors that may help the patient make his or her own decision. If this type of honest, balanced, open discussion takes place many patients will elect to forego surgery but many others will opt to have surgery. There is no right or wrong patient decision but there is a right or wrong way to supply information to patients. Being a fast, technically proficient surgeon with a high-volume practice that generates lots of money is an enviable position to have if the surgeon is honest with what he/she says to patients. House staff and partners may not be privy to our surgeon’s discussions with his patients. The house staff may not really have the knowledge to know what is right in this situation and the partners may be motivated by jealousy rather than altruism. Certainly, if the Chairman believes that our surgeon is acting unethically the Chair has an ethical responsibility to discuss the matter with the surgeon and if our surgeon is found to be unethical and chooses to leave rather than alter his practice pattern - good riddance, as patients and house staff will be better off. We surgeons have an ethical responsibility to supply accurate information to patients with AIS and to give a good faith effort to help patients and families make their decision concerning surgery. We should never influence these patients to have surgery simply because it will provide us with either fame, fortune, or academic advancement. On the other hand, we should respect patients concerns even if these concerns may be more cosmetic or psychological as opposed to conventionally medical. It is very difficult for us surgeons to police one another and no oversite will totally eliminate unethical behavior. The best approach is for all of us to honestly put the patients’ interest above our own and let the chips fall where they may with respect to the decision to opt for or against surgery. House staff attendance in clinics that are staffed by knowledgeable, ethical senior staff is the best antidote to prevent the continuance of unethical surgical behavior by future surgeons. Our journals must also be open to alternative approaches to the care of AIS patients. In conclusion, only our case scenario surgeon really knows whether his behavior is ethical or unethical. We need to police ourselves. Unfortunately, we don’t have enough knowledge about AIS to rely on administrators, organizations, or Chairs to do the policing for us. From July 11-14, 2018 we held our 25th Anniversary International Meeting of Advanced Spine Techniques (IMAST) in Los Angeles, USA, which was again very successful. The meeting was again led by our chair, Ron Lehman and had a total of 676 registered participants. I personally and in conjunction with the whole IMAST committee would like to thank Ronald A. Lehman Jr., MD for his tremendous work as chairman of IMAST during the last three years. During the LA meeting we held three focus group meetings with attendees to evaluate what has worked well with the IMAST programs over the last few years and what can be improved upon. The results will be further analyzed and discussed at the IMAST Committee meeting right before the Annual Meeting in Bologna. For the first time, the IMAST Committee is asking the membership to submit proposals for didactic sessions at the 2019 meeting. An online application will be launched on September 15th on the Members Only page of the website. All members are encouraged to submit their proposals for ICLs, debates, case series, and other sessions that they think would fit well into the 2019 IMAST. Please submit your applications by October 31, 2018. With the help of Han Jo Kim, MD, IMAST Co-Chairman and SRS President Elect Peter Newton, MD, we anticipate an outstanding venue and program at next year’s IMAST meeting in Amsterdam, Netherlands. This city also has a lot to offer, especially its canals and historic sites. The whole organizing committee looks forward to meeting with you and your families there. The nominating committee met on two occasions via conference calls in March and April. The Research Committee reviewed 22 grant applications for the Spring 2018 cycle. A total of $114,503 was approved for seven proposals. Three proposals had $25,000 of funding approved and four proposals received $10,000 of funding. In addition, meetings were held where discussions to create guidelines for both Research Committee members who review the grant applications and for researchers applying for the grants. Intervertebral fusion has been performed with autograft, allograft, and biomechanical devices usually made of synthetic materials including PEEK and metals, most commonly Titanium. The primary goal of intervertebral fusion with any of these materials is to maintain or restore disc height and alignment while promoting spinal arthrodesis. The use of intervertebral mechanical devices has increased dramatically in recent years as have implant design and fixation techniques ultimately leading to a revision in the codes used to describe them. This article will review coding for intervertebral biomechanical devices, outline the recent changes that have been implemented, and some of the nuances associated with their use. This article only discusses the use of biomechanical devices as coding with bone graft materials has not changed. Prior to 2017, placement of intervertebral biomechanical devices was reported with CPT code 22851. This procedure was used most commonly in anterior cervical and lumbar interbody fusion procedures. The utilization of 22851 expanded dramatically as it came to include a growing number of PLIF, TLIF, ALIF, XLIF, and DLIF procedures. The increased utilization of 22851 came to the attention of Centers for Medicare and Medicaid Services (CMS) which led to a review by the AMA Relative Value Update Committee (RUC). Nonetheless, the utilization of 22851 continued to rise from 45,175 in 2005 to 126,885 in 2015 while payments increased to $50,144,684. Due to this growing utilization and high expenditure the RUC recommended review of the code by specialty societies including the American Association of Neurological Surgeons (AANS), the Congress of Neurological Surgeons (CNS), the American Academy of Orthopaedic Surgeons (AAOS), and the North American Spine Society (NASS). Based on this survey the RUC and specialty societies determined 22851 no longer accurately described the various ways in which the devices were currently used. One area of particular confusion was the growing trend of employing intervertebral biomechanical devices with integral fixation (screws or flanges) and reporting anterior instrumentation (22845-22847) with 22851. Due to these concerns the RUC and specialty societies subsequently referred the code to the AMA Current Procedural Terminology (CPT) Editorial Panel to create new codes for the devices. These new codes are add on codes, reported per level, and not subject to the 51 multiplier procedure modifier. These codes are also inclusive of any “integral anterior fixation” such as flanges and screws which typically pass through the device and are used to anchor the biomechanical device to the vertebral body. The purpose, biomechanical design, and work involved with device anchoring is bundled into these codes and distinct and separate from anterior instrumentation used to stabilize the vertebral column (22845-22847). This code is typically reported for various interbody fusion procedures when an invertebral biomechanical device is inserted to fill the discectomy defect. This might include anterior lumbar interbody fusion (ALIF), direct lumbar interbody fusion (DLIF), extreme lateral interbody fusion (XLIF), posterior lumbar interbody fusion (PLIF), transforaminal interbody fusion (TLIF), and anterior cervical discectomy and fusion (ACDF) procedures. Work includes preparation or templating the endplates and insertion of the device including any fixation “integral” to the device. Generally, the device height would correspond to disc height (cervical 5-7mm, lumbar 10mm) although some devices are designed with various degrees of lordosis to facilitate restoration of lordosis. This code is reported for fusion procedures when a biomechanical device is inserted to fill or replace a corpectomy defect. A corpectomy defect usually includes discectomy of the level above and below the vertebral body that is removed and involves resection of a minimum of 1/3 (lumbar) to ½ (cervical) of the vertebral body. The mechanical device is inserted into the defect engaging the inferior endplate of the cephalad vertebral body and the superior endplate of the inferior vertebral body. For this reason a device used to fill a corpectomy defect would likely measure >2cm in the cervical spine and >5 cm in the lumber spine. This code is reported for the unique situation where a biomechanical device is inserted in a defect and a spinal fusion is not being performed. The most common scenario is a spinal infection or tumor treated with discectomy or corpectomy and placement of a biomechanical device into the defect to stabilize the segment. This could be a temporary solution to allow for post op radiation therapy or repeat I+D before returning for a definitive fusion procedure or it could be done for palliative treatment where a fusion isn’t planned. Again, the use of integral fixation to anchor the device to the vertebral body is inclusive to this code. Anterior Instrumentation and biomechanical device codes. As discussed earlier part of the reason for developing new codes was to distinguish the role and coding of instrumentation “integral” to the device and used to anchor the device to the vertebral body from instrumentation used to stabilize the spine (22845-22847). Many device manufactures had developed various instrumentation techniques including small mini plates, flanges, and screws to anchor the device to the vertebral body. The use of such devices and the work of inserting them is bundled into the new codes and it’s inappropriate to report anterior instrumentation codes for them. Anterior instrumentation (22845-22847) on the other hand are stand alone devices which are designed and manufactured to biomechanically stabilize an unstable spine following discectomy, corpectomy, osteotomy, or deformity correction. They include plates, rods, and screws and can be used as stand alone instrumentation or in combination with various allograft, autograft or biomechanical device implants. Anterior instrumentation must span any defect to the vertebra above and below. They are not “integral” to biomechanical devices, are not bundled into their codes (22853, 22854, 22859) and can be reported separate from or in addition to them when used. Nonetheless, CMS and the National Correct Coding Initiative (NCCI) interpreted the codes 22853 and 22854 as being inclusive of anterior instrumentation. They subsequently implemented an NCCI edit April 1 2017 for the device codes (22853-22854) excluding their use with anterior instrumentation codes (22845-22847). They do however, allow use of modifier 59 to bypass these edits if a provider uses additional anterior instrumentation unrelated to the anchoring device. For example an anterior corpectomy C5 with C4-6 fusion and instrumentation utilizing a biomechanical device would be coded 63081, 22554, 22585, 22854, 22845-59. The use of a structural allograft/autograft instead of the biomechanical device does not trigger the NCCI edit and denial and does not require modifier 59. Its worth noting that the original biomechanical device code 22851 was valued at 6.70 RVUs. During the process of creating the new codes the AMA RUC determined new values based on member surveys which CMS then revised down to 4.25 and 5.50 for 22853 and 22859 respectively. This tendency for code re-evaluation to result in a decrease in RVU value is not uncommon and remains a prominent concern anytime a spine code or family of codes gains attention for reconsideration. Liz Vogt. A Closer Look at Biomechanical Cage and Device Coding. ISASS. Nov 21, 2017. This present report summarizes the SRS financial position as of December 31, 2017. It is too early in our fiscal year to make meaningful statements about 2018 because so much of our financial health depends upon the performance of IMAST and the Annual Meeting. Unfortunately, this report is somewhat mixed. The bad news is that the SRS experienced a General Operating Net Loss for 2017 of $688,401 against a projected loss of $131,000 per the 2017 budget. As one might expect there were multiple reasons for this. The largest one was the IMAST meeting in Cape Town, which resulted in a net loss of $281,000. The expenses for this meeting only exceeded budget by $38,000, with the majority of the loss resulting from decreased revenues from registration and exhibit fees. Fortunately, the 2017 Annual Meeting in Philadelphia enjoyed a net income of $243,000, though this was less than the budgeted net income of $288,000, which also contributed to the overall loss for 2017. The Journal operated at a net loss of $65,000 with receipt of royalties and the editorial stipend from Elsevier, minus payment of member subscriptions. The directed courses in Europe and Asia combined for a loss of $68,000, while the traditional Worldwide Courses, including a live surgery course, lost a combined $27,000. An additional bright spot was the two Hands-On Courses (cadaver based) which combined for a net income of $100,000 against a projected income of $77,000. In addition to these larger losses, there were other budgetary overruns resulting in the General Operating Net Loss as noted above. In response to 2017’s loss, the SRS leadership team proposed and the Board approved a budget for 2018 that will only result in a projected $1,850 loss for the entire year. This has been accomplished primarily through a modification of spending and with the reasoned expectation that the recent IMAST in Los Angeles will prove profitable, as most past meetings have been. The final accounting for this meeting is in progress. It is also expected that the Annual Meeting in Bologna will be well attended and profitable. The investment strategy for the Endowment fund will remain the same with Rockefeller and Vanguard, though as most realize, returns for 2018 have not been nearly as strong as for 2017. Through May 31, 2018, the SRS investment portfolio is up 0.4% for a gain of $50,000 after expenses. The Leadership team is quite aware that the decreased investment revenue makes it ever more important to closely monitor the financial health of the SRS and make further adjustments to the budget as necessary. This fiscal diligence will ensure that the SRS remains the leader in research and education that will allow its members to provide optimal care for all patients with spinal deformities well into the future.